Ray Everitt is riding from the South of France to Berne, Switzerland! 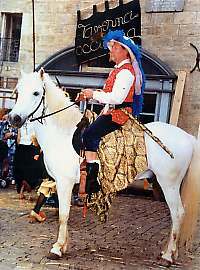 Ray Everitt and his 13-year-old Camargue horse, Black, have been riding from Ray's home in the South of France to Berne. On 5th May Musician Ray Everitt set off on the journey of a lifetime, a 1,000 mile trek through France and into Switzerland. Ray will be making music along the way, and raising money for a French charity that helps victims of autism. He expects the journey to last around six weeks. Ray has been in close touch with Gérard Barré, webmaster of World Trail Rides and a Long Rider with a lot of experience riding in the French mountains, who has been able to advise Ray on some aspects of his wonderful ride. Part of the trek will take Ray and Black through the Cevennes, a region of mountains just north of Gabian which has already been immortalised in print as the scene of Robert Louis Stevenson's 'Travels With a Donkey', published in 1879. In Pezenas, the nearby market town, a bar called 'Le Stevenson' to commemorate the event exists to this day. 'Travels with a Donkey' has been reissued by The Long Riders' Guild Press, and can be found on www.HorseTravelBooks.com. Oh! We’ve done it ! The Rhone rushed furiously along in front of us, swollen by the rains which had caused so much damage in the area – and which had soaked us for three or four days! On the other side of the river: Switzerland! We stayed there until 17th June, before leaving for Gex. At 6,000 feet above sea-level, it was very cold. Brrr! With a fantastic view over the Alps, we carried on slowly towards Les Rousses. We spent one day there on the edge of the lake. Unbelievably, it was 37 degrees (99 degrees Fahrenheit)! What a difference in a few days! When we set off at 5 a.m. for La Chapelle des Bois there was a fresh pink dew. The following day, Black got his hind foot caught in a partially-buried cable. In spite of immediate first aid, walking bothered him. A few days later, I was able to get suitable treatment for him at Villers-le-Lac. On 29th June we made it! We arrived in Berne, Switzerland, after about 1,300 kilometres. We are very, very happy, but extremely tired. We gave a little recital in Berne, ahead of the big concert on 1st July. On Saturday, 13th July, we were back home in Pézenas, where everything began so many weeks and kilometres ago. It was good to be home. Many of my musical friends turned up to give an impromptu concert on the terrace of the Café du Midi. At the end of this wonderful day, I sat down and thought to myself – what a marvellous adventure! And, perhaps not the last one after all." Click here to read earlier installments of Ray's journey. Please visit Ray's website: www.black-et-ray.org.